Your stove should never be used in a manner to cause over firing. Over firing can be caused by over loading the stove with fuel, and with primary controls open. If any part of stove glows “red” your stove is over firing and your draught control should be adjusted to restrict airflow to stove. Over firing can cause permanent damage to the appliance which is not covered by warranty. We would strongly recommend the use of a stove thermometer which will help you monitor your stove’s performance. Why Should I 'Run In' My Stove? To begin, light a series of small fires over a period of a few days to allow the paint finish to cure. If the stove is not “run in” correctly, this may cause the paint to discolour and flake. The finish can be repaired with proprietary stove paint. A smoking stove can be caused by a flue with back draught problems, or a blockage in the chimney. A qualified fitter should complete a smoke test prior to fitting the stove to ascertain the integrity of the flue. We would recommend that you contact your Hetas fitter to establish the cause. Commissioning a solid fuel or gas stove, fire or fireplace is a compulsory procedure to ensure that the flue/appliance/room ventilation is in accordance with building regulations, safety requirements and the manufacturer’s installation/operation instructions. This is completed following installation of the appliance. Each stove has air controls to regulate the heat output. Keeping the air flowing correctly through a wood-burning stove is essential for safe and efficient operation of the stove. Fresh air needs to enter the wood compartment to provide oxygen fuel for the fire; as the fire burns, the smoke must be allowed to rise through the stove pipes, and exit through the chimney. We want you to enjoy the maximum performance from your appliance products. To ensure this, it is essential that they are installed correctly. We strongly recommend that your Penman Appliance is installed by a suitably qualified/competent person. See our list of retailers page for more information. Are wood and multifuel stoves easy to light and control? Yes, stoves are generally quite easy to light with dry kindling and newspaper. Once lit simple air vents can be turned to control the intensity of the blaze and amount of heat. Does my stove need a guard? A suitable fire guard is recommended for all fires for the protection of the young, infirm, elderly and pets. A fire guard not only prevents hot material from falling from the fire but also prevent clothing from coming into contact the naked flames or embers. How often should I clean ashes from my stove? A wood burning stove often benefits from having a bed of ash so, depending on use, will probably need cleaning out no more than once a week. In contrast a solid fuel stove should be riddled and the ash removed daily. Essentially it’s the type of grate they use. For burning wood a flat grate is required with air directed into the top of the fire. For solid fuel, air must be directed through the fuel from underneath. Should I use a stove fan? A stove fan is an effective device that is placed on top of your stove and is designed to circulate heat throughout living spaces. Their purpose is to create comfort through the even distribution of heat. The main reason for having a moisture meter is to get an accurate reading of the actual moisture content of your logs. They are often used for those people who are cutting and seasoning their own wood. But more importantly, they can be used to check the quality of wood bought from suppliers and make judgements on when firewood is ready for burning. Seasoned firewood should have a moisture content of 20% or less. We supply high-quality ash kiln dried logs which are the perfect fuel for your new stove. Not only efficient they are easy to light, produce ample heat, and a roaring flame! Call us on 01204 868 550 for details. What does Defra 'Approved' mean? A Defra Approved stove, is a wood burning stove which has been tested and passed the UK Government’s Department of Environment, Farming and Rural Affairs (Defra) criteria for emission levels. Generally, a ‘Defra Approved’ stove has been modified by the manufacturer to limit the amount that it can be ‘closed down’ or in other words, by how much it can be starved of air which creates smoky combustion. A Defra Approved stove will therefore always provide the minimum level of combustion air so that the wood burns efficiently without producing unnecessary smoke, thus ensuring that the appliance complies with the Clean Air Act. A Defra Approved wood burner will, therefore, allow you to burn wood legally in a UK Smoke Control Area – most of the UK’s cities and large towns. All Penman products are subject to the terms of the Warranty Policy and guaranteed against defective workmanship, faulty components and material as specified below. Subject to the specification of the appliance the warranty will run from the date of installation providing the appliance is installed within 6 months of its despatch from Percy Doughty Ltd. The warranty periods listed below apply when the appliance is purchased from one of our exclusive dealers. Any variation to the warranty period must be approved in writing by the Company. It is a requirement of the warranty that an annual service is carried out on the appliance by a suitably qualified person and installation complies with relevant Building Regulations and the rules in force. Records and receipts of annual services will be required in the event of a warranty claim. This must be carried out by a suitably trained and qualified individual (HETAS registered or GasSafe registered in the United Kingdom or equivalent) with a certificate of installation and the appropriate commissioning report completed and retained by the end-user. Gas Appliances – 3 years’ terms and conditions apply. Electric Appliances – 1 year terms and conditions apply. Damaged items should be reported within 5 days of delivery; please provide as much information as possible and photographs if applicable; any damaged packaging should be retained for inspection by our approved representative. Do not use until you have been advised by a Percy Doughty or Gas Safe representative that it is safe to do so. Missing Items must be reported within 5 days of delivery. Carefully check components against the list supplied and thoroughly inspect packaging for any small items that may have become dislodged in transit. If parts are missing please provide as much information as possible. Please log a call if the missing item is affecting the operation of the appliance. Once the property has been made safe the Gas Emergency Engineer will explain any work that is required and to which appliance, this should only be carried out by a Gas Safe registered engineer. Producing soot can be a sign of incomplete combustion for a variety of reasons – Do not use until you have been advised by a Percy Doughty or Gas Safe representative that it is safe to do so. You should fit a carbon monoxide alarm in any room that contains a fuel burning appliance. The sensing technology in a CO detector is different from that used in a smoke alarm. Carbon Monoxide detectors measure the amount of CO and the time of exposure. The alarm will sound before carbon monoxide levels becoming threatening for average, healthy adults. Check that all ceramics are present and correctly positioned. Do not add extra ceramic pieces to the appliance as this can result in incorrect combustion. If any of the ceramic components become damaged then we recommend that the complete ceramic set is replaced with genuine manufacturer’s parts. They need to be put in a central location in the house and can be fixed to the wall or can be placed on a table, bookshelf or shelf. Don’t block ventilation and have chimneys swept at least once a year. Check gas supply into the property by operating other gas appliances – if there is no gas supply contact your gas supplier. If the gas supply is operational but the fault persists please log a warranty call. The appliance requires one 9V PPS battery and is located behind the ash pan cover, under the fuel bed. If the battery needs replacing ensure that the + and – positions are aligned correctly. If the problem persists an Engineer will be required – Please log a warranty call. To log a warranty call online follow the link http://www.visionfires.co.uk/helpdesk/ alternatively call 01204 868550 and select option 3 – Technical. For safety, this appliance is fitted with an oxygen sensitive pilot system. This will cut off the gas supply to the appliance if the oxygen level in the room falls below its normal level. If this happens it usually indicates that there is a problem with the flue system. The fire must not be used and the problem must be corrected by a competent person. NB this device is not a substitute for an independently mounted carbon monoxide detector. If a fault is intermittent please monitor over a period of a few days and note details down of frequency and length that the fault is apparent. It is often useful to note events immediately prior to and following the fault occurring i.e. colour and appearance of flames; any unusual noises or smells or if it happens on a regular basis at the same time of day or at the same time of another activity within the home i.e. other gas appliances being used. Extreme weather conditions can also affect the operation of some appliances. Photograph or record recurring incidents. Do not handle or attempt to clean the glass when it is hot. If the glass breaks carefully remove any sharp pieces that are easy to dislodge – we recommend that the glass is only replaced by a suitably qualified and experienced engineer as it is very important that a complete seal around the glass is achieved. Failure to do so may result in incorrect gas combustion which can have fatal results. Do not operate the appliance if the glass is cracked, broken or missing. Correct Procedure – Push the control lever fully down to the ‘P’ position and hold there until the pilot lights. Hold for at least a further 10 seconds to allow a stable flame. Release the control lever and it will automatically raise to the ‘LO’ position. The fire is now at minimum heat setting. Lift the control lever up to the ‘HI’ position. You will feel a positive location check when the lever reaches this setting. The fire is now at the maximum heat setting. The lever can be moved between the low and high positions to achieve your desired heat setting. If, for any reason, the flame extinguishes or does not light on initial attempt Do wait three minutes before attempting to relight as the fire is fitted with a safety device that will automatically shut off the gas supply to the fire, if for any reason, the flame goes out. Please contact our Technical Service Department on 01204 868550 or log a call leaving the best contact details for the Engineer so that a member of our Technical Team can assist. Please give full details of Fault and include photographs or recordings where appropriate. What is a cast iron insert? A cast iron insert is a decorative plate that incorporates a fire, and comes in the form of an arched insert or tiled insert. Many of our inserts have the opportunity to burn several types of fuel such as wood, coal, gas or electric. With the exception of the efficiency plus range and any chrome finishes, all our inserts featured are suitable for burning multi fuel; however polished and highlighted products will tarnish. I would like to burn solid fuel which cast insert is best? When burning solid fuel it is recommended that you choose a black finish, preferably with a refectory brick back. Can I have any combination of insert, surround and hearth? There are endless permutations of inserts, surrounds and hearths. 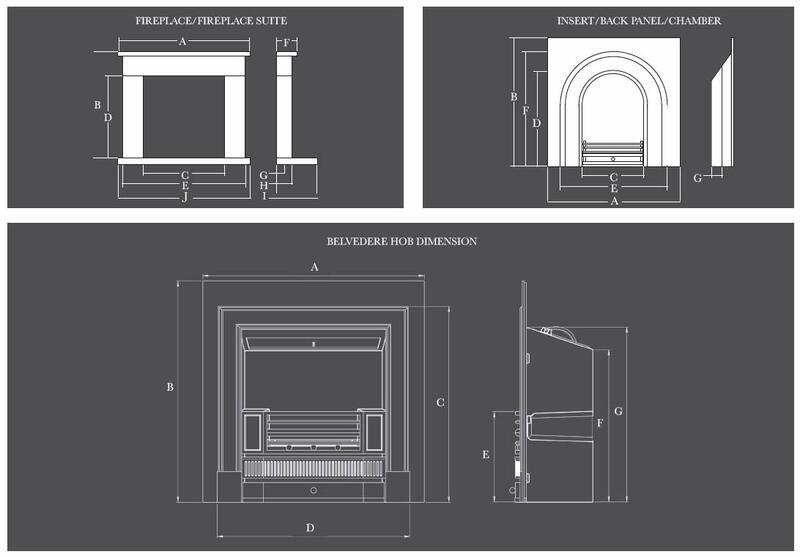 Most inserts will fit our surrounds, please check the dimension chart to ensure that there is sufficient width to accommodate your chosen insert without impinging upon the leg of the surround. 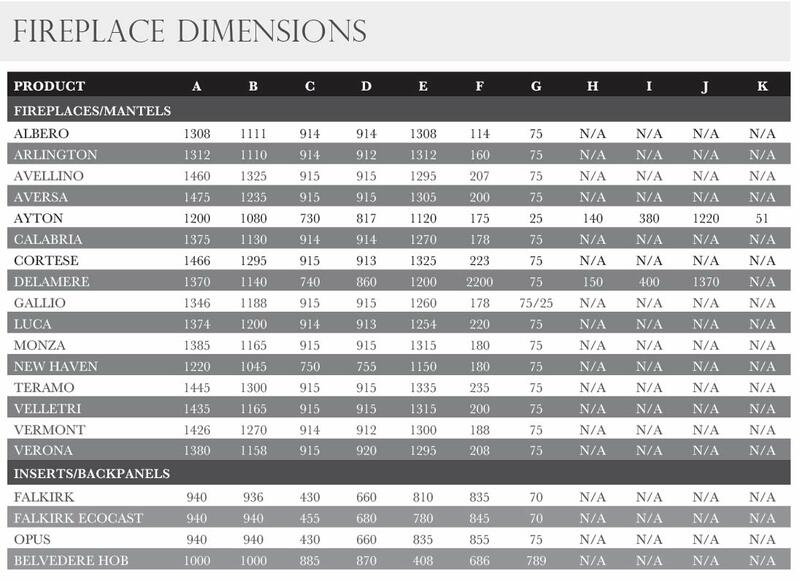 Please ensure that your chosen hearth will accommodate your surround, the mantle is designed to fit on top of the hearth rather than between the legs of the surround, please see our dimension chart to ensure the outer width of the leg will fit on top of your hearth. What types of hearths are available? Can I buy tiles separately? Yes! We have a wide selection of fireplace tiles available, please speak to your approved retailer for details. How do I clean my cast iron fireplace? Keep the fireplace oiled using a thin coat of a light oil, such as 3 in 1 or WD40. This treatment should be carried out at least twice a year or as required. Any surface rust should be removed using a fine grade wire wool with oil. This will not scratch the cast iron, the more you rub, the more of a mirror finish will be achieved. Avoid exposing the cast iron surface to moisture.